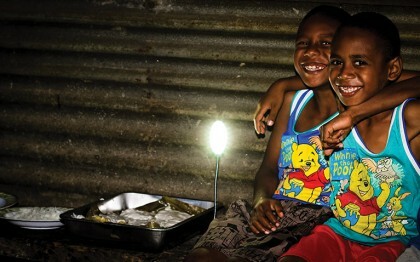 In the aftermath of Cyclone Pam, David Cook visited Vanuatu to see how things have developed. 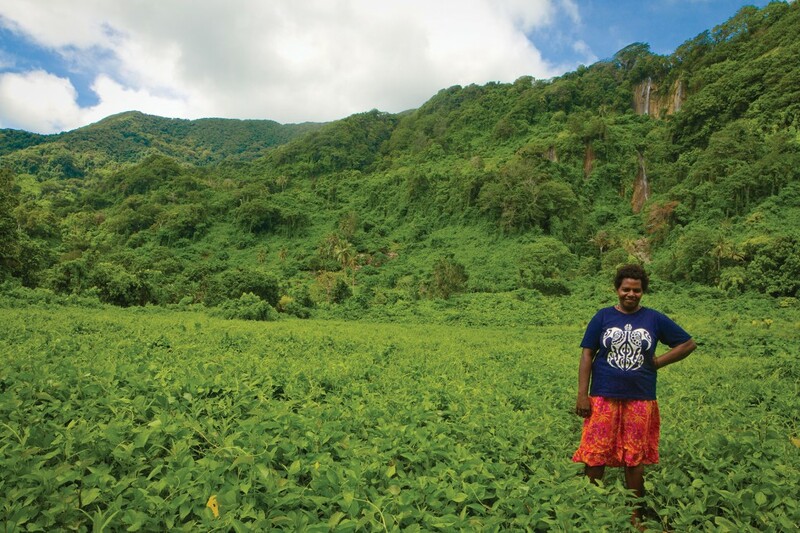 Claudia Roline-Kokona stands in the middle of a lush, green open area near her community. The oppressive heat doesn’t diminish the beauty of the view before me, my Australian eyes drinking in the open, green field framed by trees and the waterfall spilling over the cliff in the background, with the soundtrack of the nearby Pacific Ocean filling my ears. It looks idyllic. But looks can so easily be deceiving. This open green area should be full of the staple crops grown in this part of Vanuatu – water taro, banana, kumala (a sweet potato variety) and more. In March 2015, Cyclone Pam swept through this part of the country, causing widespread destruction throughout Claudia’s community – including destroying all of their crops. But when we visited in February this year, the fields were still empty, because Cyclone Pam was quickly followed by the El Nino drought, which meant attempts to re-plant had failed. It’s a striking illustration of the conclusions of the 2015 World Risk Report, which declared Vanuatu the riskiest country in the world to live in. Natural disasters affect about one-third of the population each year, with the remoteness of many communities complicating relief efforts. Claudia’s community is on the east coast of the island of Maewo, in the north-east of Vanuatu. It is highly isolated – to reach it we had to travel by small plane, boat, 4WD ute and then walk down a large mountain through the tropical heat and jungle. There is no mobile phone access. During the cyclone, the community’s 600 people squeezed into the two school buildings, with a priority for the vulnerable, such as the elderly, disabled, and women and children. But not everyone could fit. “Some had to remain outside, because there is lack of space inside the classrooms,” said school principal Hendrix Aru. He said that some people had to stay in the community, sheltering as best they could in their own homes, and those in the school buildings were jammed in tight. Then the cyclone ripped the roof off one of the buildings. In the middle of the storm, people had to try to make their way to the other building, which was already full. “It was a very, very dangerous situation,” said Hendrix. “We had people screaming, crying, moving, shouting. Makes it all confused.” It was a miracle that nobody was injured. Hendrix said that when the cyclone had moved on, many trees and houses had been blown down, there was dirt and flooding around the community, dead animals and, the biggest impact of all, the destruction of the crops. Claudia has six children, with four of them still at home. She said that after the cyclone, the fields were just bare ground – all the trees had been knocked down and all the water taro had been washed out. Struggling to feed her family, they had to eat what they could find of the fallen and rotting crops. After a few weeks, emergency supplies of rice arrived from our partner, the Anglican Church of Melanesia (ACOM). The rice was taken by boat to the west side of Maewo, and then hauled by truck up the mountain range that runs down the middle of the island. But because there is no road down to the east side, community members had to climb up and carry the bags of rice down by hand themselves. This rice fed Claudia’s family for three weeks, and was very important for helping to sustain the community in the aftermath of the cyclone. “I would like to say a very big thank you to you guys for giving us the rice,” said Claudia. When Cyclone Pam struck, our initial plan was to help restore people’s livelihoods by distributing seedlings to help regrow crops that were destroyed, along with agricultural training. However, as the fields in Claudia’s community demonstrate, the El Nino drought meant that there was no point planting crops, as they would not have survived. The combination of the cyclone and the drought revealed that more work needed to be done to help communities be prepared for such events. So, we joined forces with ABM to support a more comprehensive response from the Anglican Church of Melanesia to help communities better prepare for disasters such as cyclones and droughts. Helping to build improved emergency shelters in communities. Helping to install more and improved rainwater-harvesting, such as rainwater tanks, to improve water supplies for communities and families. Improving food security. This will include supporting the restoration of kitchen gardens, agricultural training for women and men on a range of different crops, and provision of seedlings. Improving training and capacity building, particularly around disaster preparedness, that will include workshops that will be held in communities across the northern islands. Working together, we hope to help communities become able to cope better with the different challenges nature throws at them, from cyclones to droughts and more. You can help us to be ready to respond when disasters hit vulnerable nations such as Vanuatu. Make a donation to the Rapid Response Emergency Fund via our website or by calling 1800 249 880.